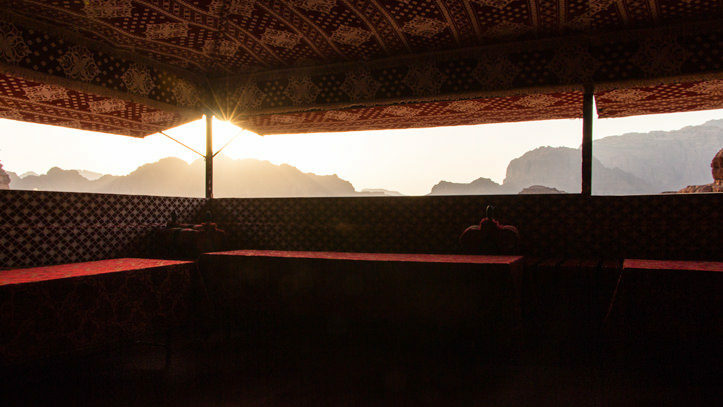 Wadi Rum Base Camp is located in a quiet spot in the Wadi Rum protected area close to Khazali canyon. 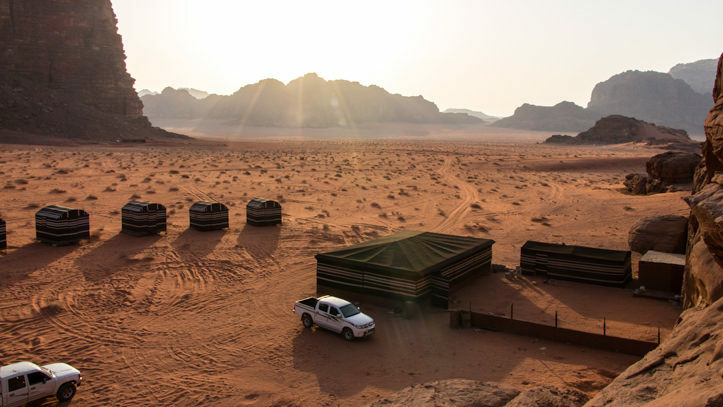 You can reach our camp be by either jeep, camel or foot (guided only). 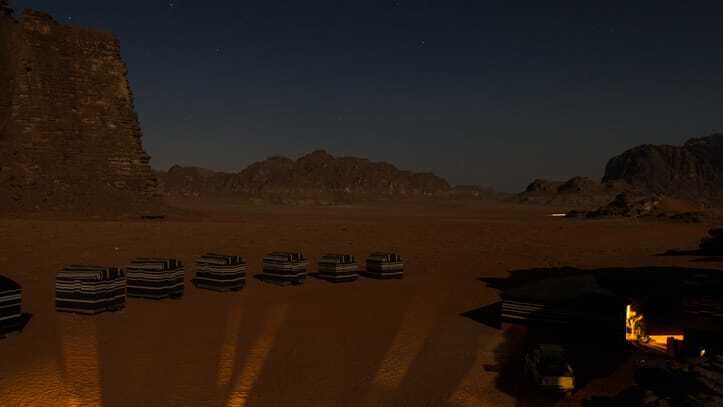 The campsite offers excellent desert views. And you can climb up the rocks next to our camp for even more spectacular views. 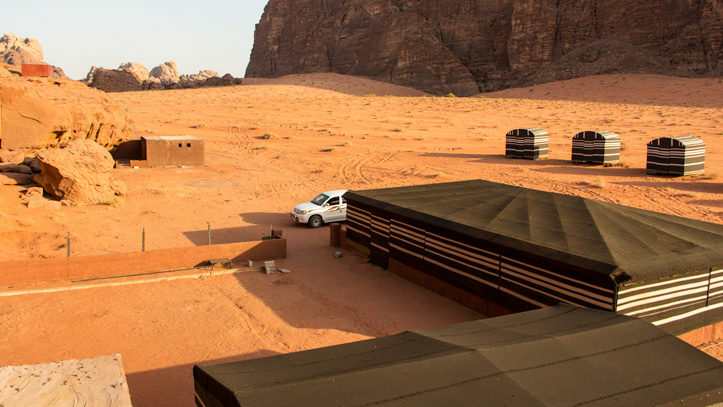 As our camp is located in the heart of Wadi Rum, it is the ideal base for exploring our desert. The sand dune, Khazali canyon and Little bridge are all within walking distance, and other famous sites are within a day tours reach. 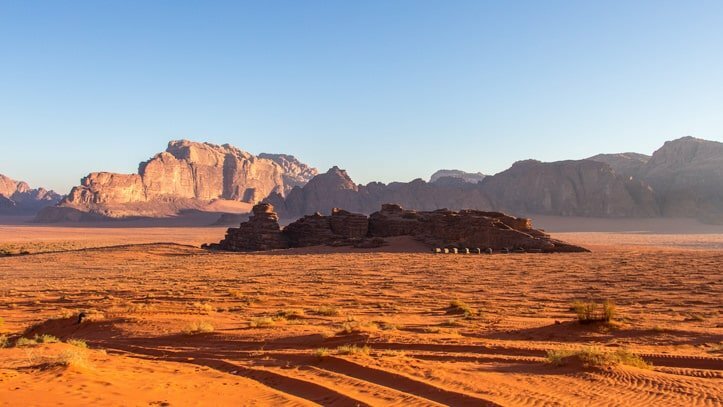 A multiple day stay at our camp offers you the opportunity also to explore the lesser visited, more remote areas of Wadi Rum.
" The facilities were spotless! The dinner was a feast." 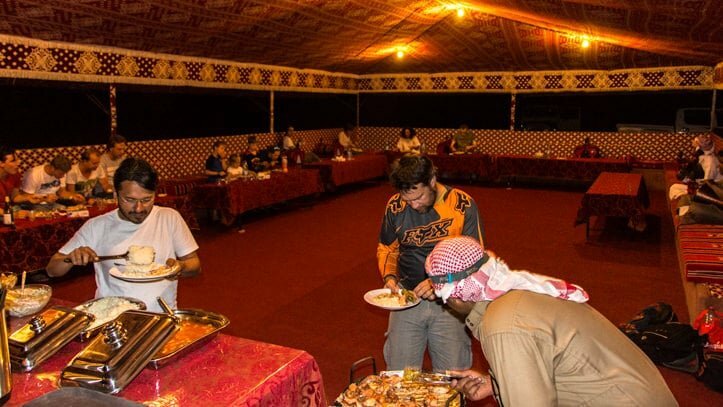 "At the camp itself where we slept, the structure is very good and you stay with comfort in the desert. Totally recommended!" "The camp was really neat from the dinner tent to the sleeping cabins and the bathroom facilities." 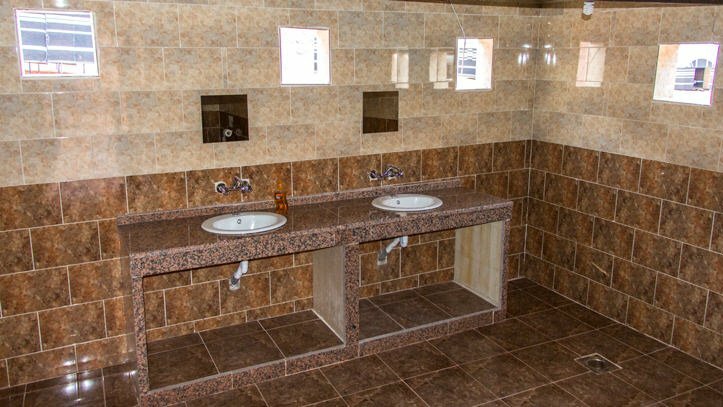 "The washroom is amazing and super clean. 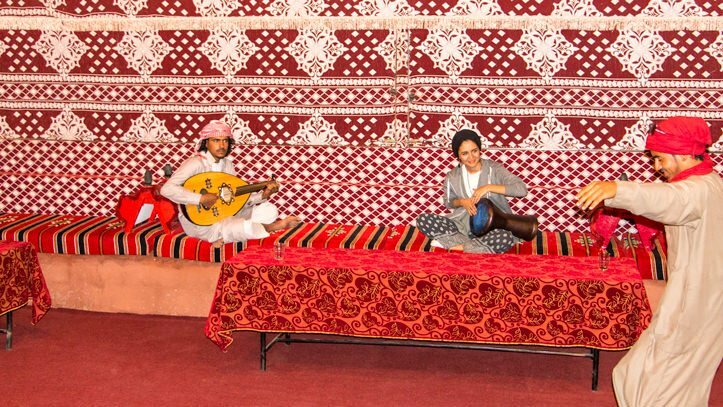 The communal tent was great for some chats and Oud playing." "Extremely nice camping area, all brand new, very clean and beautiful place, nice people, really enjoyed!" "The basecamp exceeds my expectation - super clean toilet, good bed and not to mention the BBQ dinner was delicious." 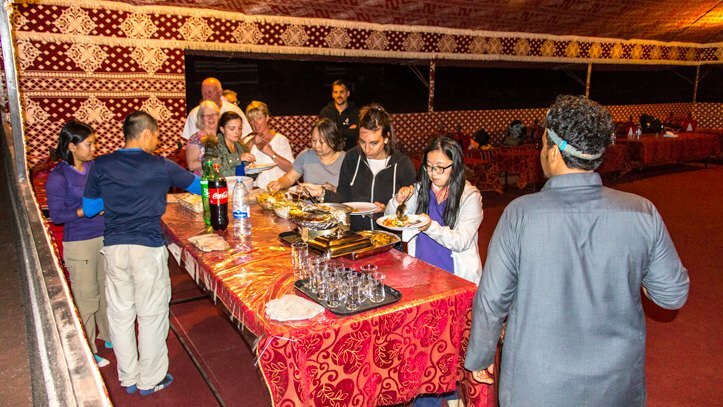 "At the camp, a feast awaited us as well as the best and cleanest shower / WC on our whole trip to Jordan ..."
"The camp incredibly clean and beautiful despite being in the middle of the desert." "The camp had the nicest toilets in all of Jordan." "A beautiful camp, new and up to date!" "The camp was spotless, tents clean and comfortable. Even toilet and shower block of high standard. " Charming, cosy and comfortable. Three words which describe our camp well. It is the perfect place to rest, relax and enjoy after a day out in the desert. Our warm welcome, personal attention and service will make you and your fellow travellers feel at home instantly. Come as our guest and leave as our friend! The communal tent and the outdoor sitting area form the heart of our camp. These are the places where it all happens! 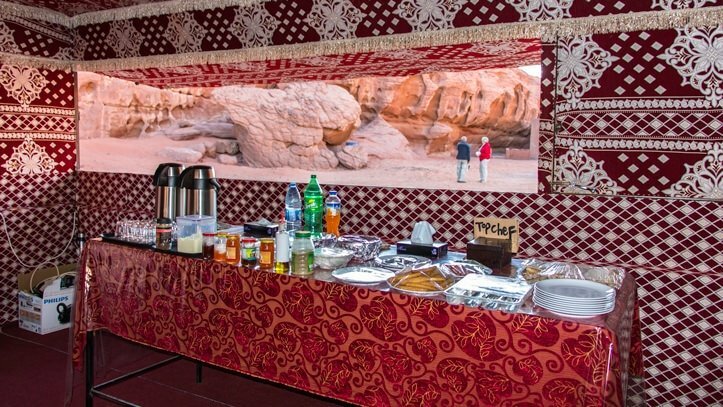 Here we welcome you to our camp, we drink the famous Bedouin tea and eat our meals. It is also the place where we talk and share stories and where we play traditional music and dance. 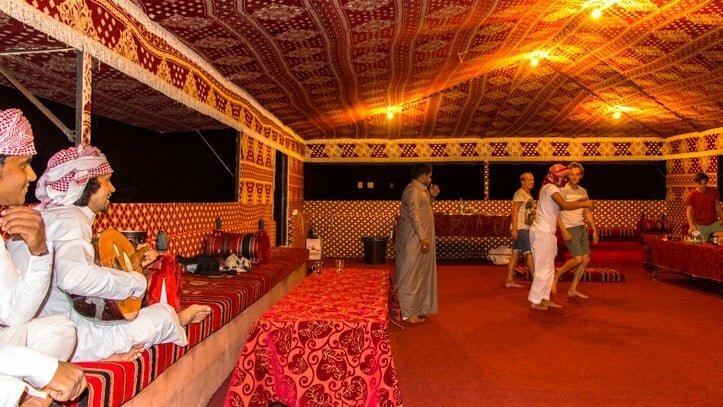 Our spacious, nicely decorated communal tent has a huge bench with thick mattresses and camel saddles to lean on, tables, stools and a buffet. With windows all around you can enjoy the mesmerising panoramic views from everywhere. During the wintertime, we close the windows and heat the tent. Next to the communal tent is the outside sitting area. 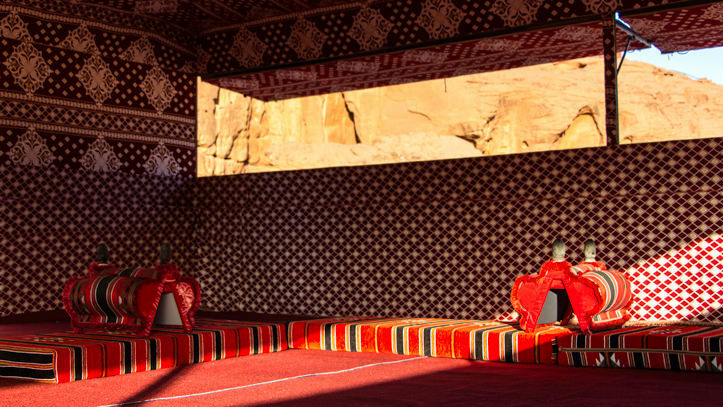 Like the communal tent, the outdoor sitting area is equipped with a huge bench with thick mattresses and camel saddles. Here we spend the long, sultry summer evenings under the billion star sky. During cooler evenings we will lit the firepit to give us warmth and atmosphere. We have a modern, clean, shared bathroom building. You have two showers with dressing area, two western toilet and two wash basins at your disposal. 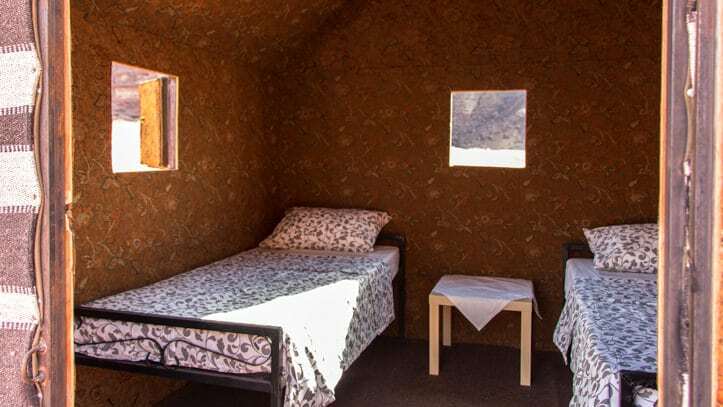 Our goat-hair, cabin-style, sleeping tents are located on the sand dune. We have ten 2-persons tents and two 5-person tents. We left extra space between the tents to grant you privacy. 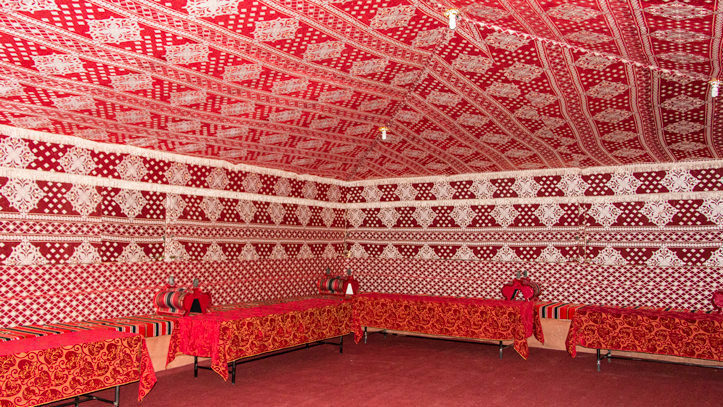 The tents are elevated and have wooden floors covered with a carpet. The 2-person tents have two windows for ventilation, and the 5-person tents have three windows. 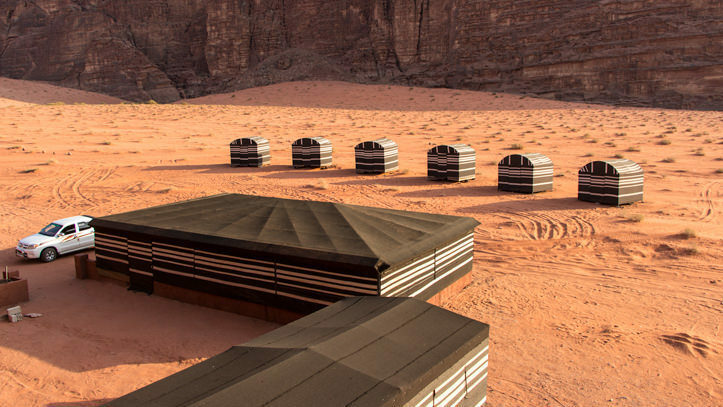 Further, the tents have everything for a comfortable stay in the desert: a light, beds, a small table, hooks and a trash can. Also, we provide pillows, bed linen and big, thick blankets to keep you warm and comfortable throughout the night. When booking your tour and overnight stay with us, we ask you to share your tent preference. If available, you get the tent type you requested. If already fully booked, we will share the alternative options with you. 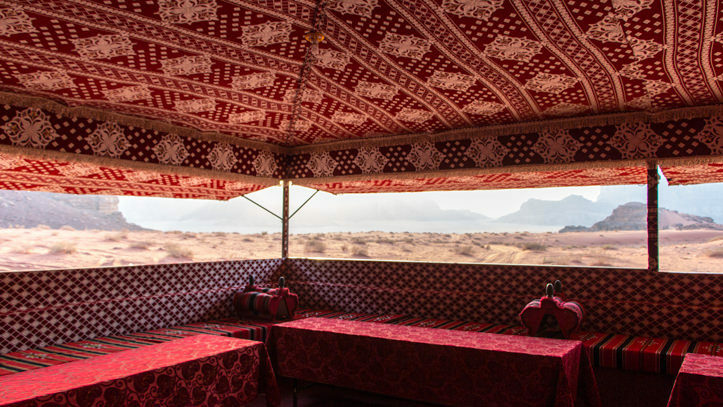 We aim to give all our guests private tents, but during the high season, single travellers sometimes need to share tents (in that case, we grant the travellers a discount). Further, families are in the lead for the 5-person tents. For children under four years, we put a baby bed in the parent’s tent. We have a beautiful spot just a short walk away from our camp where you can sleep outdoors also know as bivouac camping. Sleeping outdoors close by our camp gives you the same experience as sleeping in our ‘cave’. At night, the starry night sky as your ceiling and in the morning you wake up to mesmerising valley views. We have special mattresses, sheets and sleeping bags for outdoor sleeping. Therefore it is necessary, to let us know upfront that you want to sleep under the stars. You can do this when filling out the booking form. We serve our meals buffet-style. For breakfast, we have bread and a selection of toppings like oil & za’atar, labanah, hummus, tomato, cucumber, olives, cheese, jam and eggs accompanied by Bedouin tea, coffee and mineral water. Lunch typically consists of a freshly prepared hot dish like Galayah Bandura accompanied by bread and a selection of side dishes as hummus, cheese, tuna and salad. As for drinks, we serve mineral water, Bedouin tea and soda or juice. 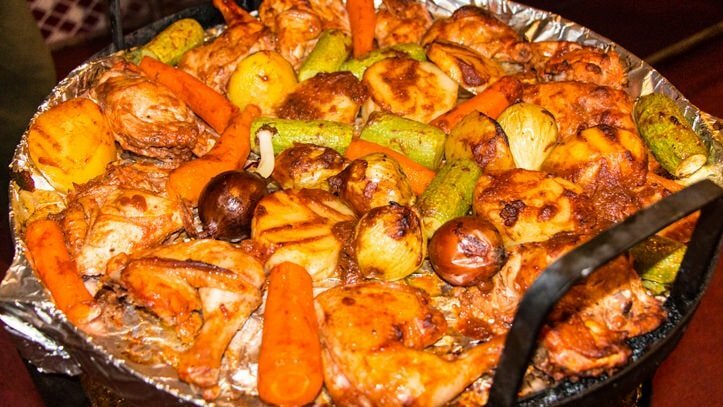 For dinner, we serve freshly prepared, traditional Bedouin food like Zarb, Khabsah or Magloubah, accompanied by bread, rice, salads and homemade baba ganoush. After dinner, we serve either sweets or fruit. As for drinks, we serve mineral water and Bedouin tea. 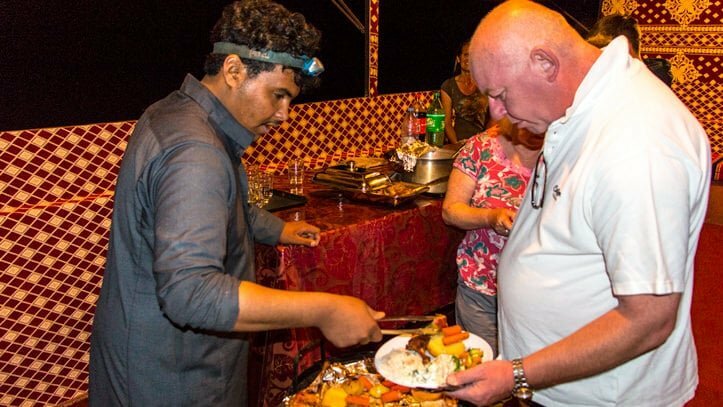 We pay attention to your dietary requirements as much as possible within the limitation that the desert. Mineral water is available for free throughout your stay. In our camp, we use the solar power which we generate with our panels. Electricity is available during the evening hours. Once you sleep, it will be switched off. So bring along a flashlight or use your mobile phone to light your way when going to the toilet at night. In the communal tent, we have a plug system (European plug) for you to use to change your mobile phone and/or the batteries of your camera. 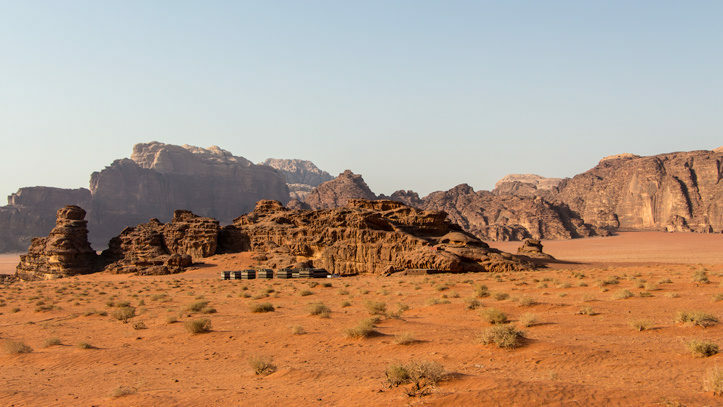 In May 2014 I started Wadi Rum Nomads, a bivouac tour company offering adventurous tours in our desert. 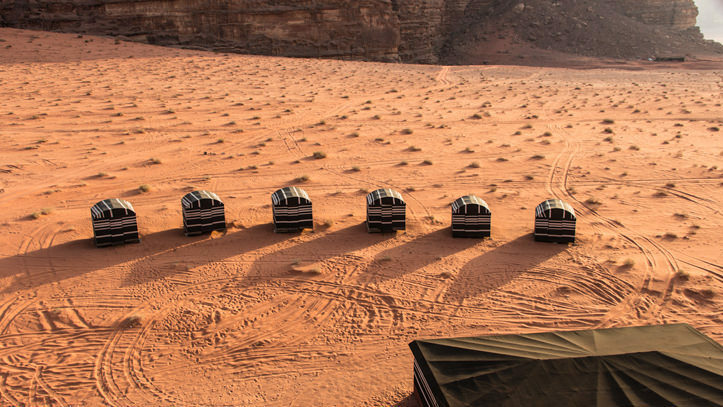 With a small team, I began to guide travellers who were looking for an adventure in Wadi Rum desert. Soon after, many more travellers followed. Quickly we built our name and got known for the high-quality experience we offer. Because of our excellent reputation, we also got more and more request from travellers who like our tours but wish to have the comfort of a bed and a shower. Until the summer of 2017, we offered these guests to stay overnight in camps ran by members of our tribe. It worked out well for our guests, but for us, it wasn’t ideal. We started to dream of having not only our own ‘cave’ but also our own camp. A place where we can host our guests as we feel it should be done. We had many conversations about what our guests value for their overnight stay and what we want our camp to be like. Further, we spend many hours exploring the desert to find the ideal spot for our campsite. In 2016 we were ready to start building our place. 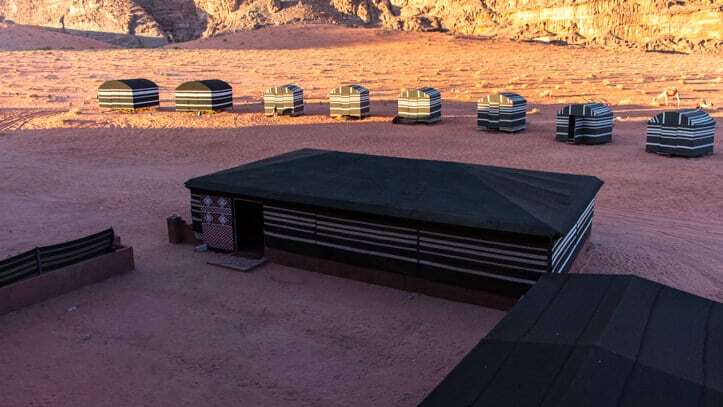 Over one year later, on the 9th of August 2017, Wadi Rum Base Camp opened its doors. Welcoming our first guests in our camp was a dream coming true!